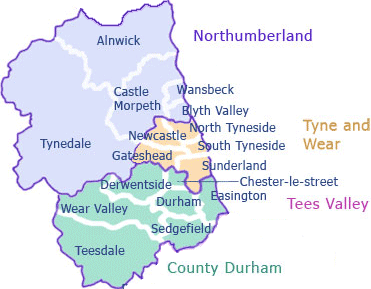 We cover the North East area of England from Newcastle to Sunderland, full garage door repair services. As stated on the left we cover Tyne and Wear from Newcastle to Sunderland. We are here to serve you and your garage doors or general garage repair. Our engineers are professional and highly qualified with many years of experience in fixing a vast range of garage door�s, from complex motor driven to simple garage lock issues give us a call. The map below gives a clear presentation of the areas we actively cover. Our garage door engineer services extend to the whole area, call today and see how we can help. If you are located within North Eastern England and have a garage in need of repair then please do not hesitate to call. We are able to cover the whole Tyne and Wear region and even the surroundings - to the Tyne Valley and Northumberland area.